At first glance the TI-31 added just a few conversions and statistical functions to the TI-30 Challenger. If you explore the calculator closer, you'll discover the electronics of the earlier TI-30 SLR. Texas Instruments continued in 1986 the Toshiba-built calculators with this TI-31 and the great BA-SOLAR. Only few month after production of the TI-31 was launched in Japan, a first redesign introduced both smaller solar cells and a new designation TI-31 SOLAR. In a next step the production of this design was shifted to China. The calculator kept the name plate TI-31 SOLAR and uses identical housing parts and printed circuit boards. The later Italian version of the TI-31 SOLAR looks completely different. View the Italian TI-31 SOLAR and BA-SOLAR for a brief comparison. The featured TI-31 seems to be identical to the later TI-30 SLR+ and the TI-35 SLR. 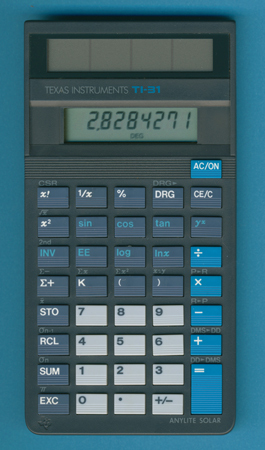 A less sophisticated calculator was introduced with the TI-30 SOLAR.